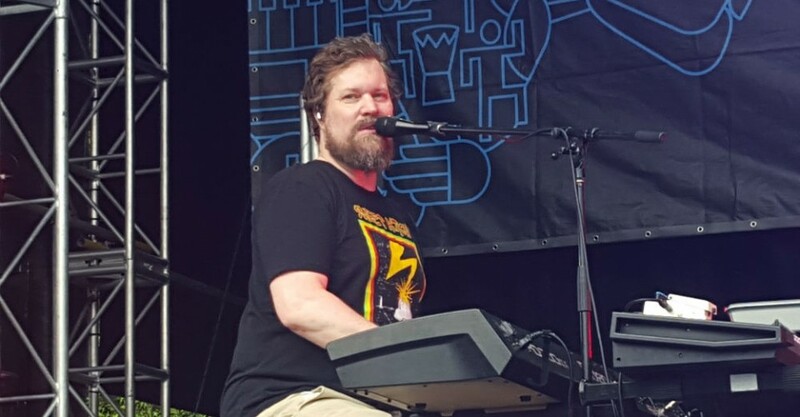 As one of the headliners on the final day of WOMADelaide for 2016, John Grant certainly didn’t disappoint both his loyal fans and those coming across his honest, emotive and sometimes quite obscure music and lyrics for the first time. His music is described as going from sumptuous tempered ballads to taut, fizzing electronica with grand melodies, which take audiences to a lofty plateau. The usual bass, guitar, piano and drums are combined with synth and various electronic beats and mixes, which sometimes keep a fierce danceable beat and other times are unexpected sounds that are made so perfectly awkward. Formally of Denver-based alternative rock band The Czars, Grant began his solo career in 2010 with his album Queen Of Denmark and has since released Pale Green Ghost in 2013 and Grey Tickles, Black Pressure, which peaked at number 5 in the UK charts in 2015. Now based in Reykjavík, Iceland, his lyrics are deeply personal referring to his anxieties, HIV positive status, past boyfriends and all the thoughts inside our head that we generally don’t say out loud. Tonight, Grant performed music from all three of his solo albums with stand out songs including, I Wanna Go To Marz, Queen Of Denmark and GMF with all the frank expletives. He displays a gamut of emotions on stage including, emotive calm moments, intense and withdrawn touches and then he is a hilarious comedian at other times, especially when he gets his groove on. An absolute pleasure to see perform here in Adelaide; an absolutely beautiful performer.